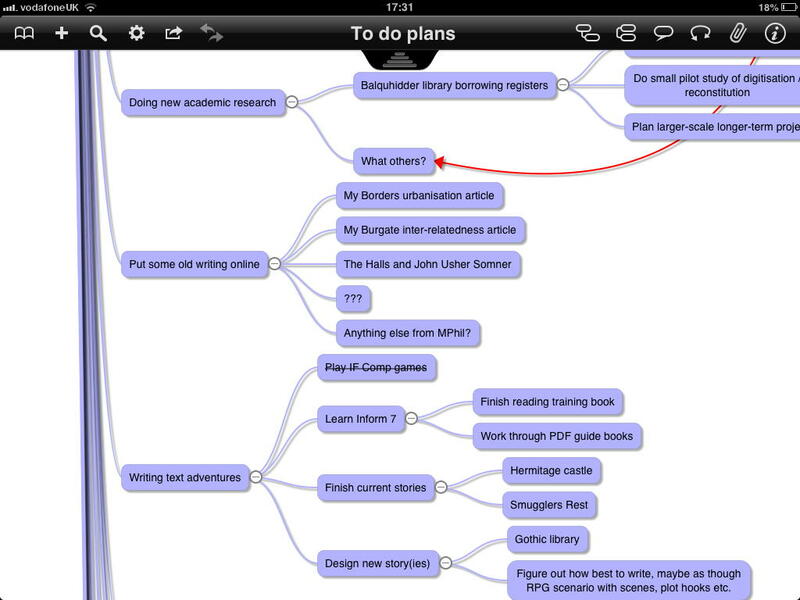 I do a lot of my research planning and writing on my iPad. For example I’ll always have a to-do list on the go there, of things I want to work on, of all sorts, ranging across academic history, through genealogy, miscellaneous writing, and computer game design. 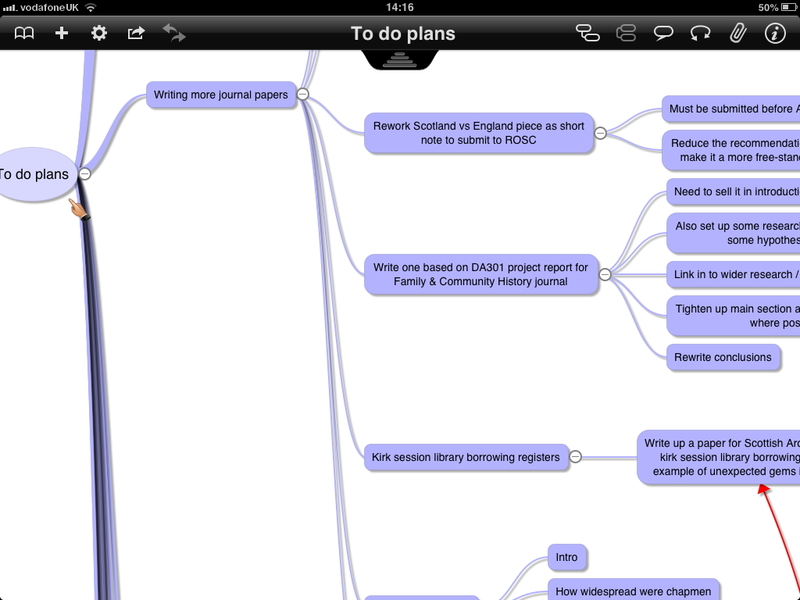 And whenever I start a new research project I will brainstorm it, again in iThoughtsHD on my iPad. But I was struck today by some of the advantages of an old fashioned pen and paper approach, even in a digital age. 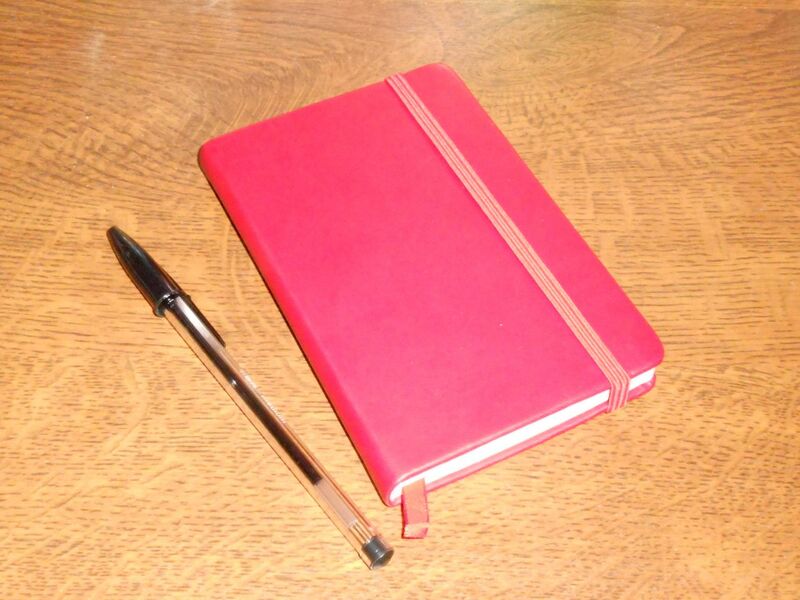 I carry a red notepad with me all the time. It’s like a Moleskine, but a fraction of the price, lovely texture, and nice to write in. It’s compact, and easily fits in my bag that I take out with me. So it’s always there, which is more than can be said for my iPad 2, which is too big for me to carry around all the time, though it’s great for working on at home. So when today I had a few minutes in the supermarket cafe, with a cappuccino beside me, I took out my notepad and had a look. The first thing I spotted was a set of notes I’d made on a similar occasion, but hadn’t transferred to my iPad, and had totally forgotten about! These are notes of genealogy things I want to work on soon, such as transcribing a court case for my Cavers one-name study, and digitising the many paper receipts I have from around the wedding time of my great-grandparents at Melrose in 1905. I must get on with these! After that initial shock, the next step was to use the notepad to develop new material. I’m writing a series of articles at the moment that are a sort of crossover between historical pieces and roleplaying game ideas, and once I’ve finished my current one about Montrose I’ll want to move on to the next couple of places. One of the upcoming articles will be about Inchtuthil in Perthshire, a Roman fort. So I took the chance this afternoon to brainstorm some ideas for this. I will move this planning at some point to my iPad though, into iThoughtsHD, and then write up the piece in WriteRoom. I really like working with a pen and paper notepad like this, but I must make more of an effort to transfer the notes to my iPad, to work on them in future, and not completely forget them. Of course this brings to mind the integrated Evernote/Moleskine notepads. But I don’t think I want one of those, even though I use Evernote a lot. I think I just need to be a bit more organised about opening up my notepad when I get home and have my iPad to hand, and transferring the ideas from one to the other. I’ve written before here about how useful I find the iPad to be as a productivity tool. I’ve been musing on this some more, in particular its use at different stages of writing and research. Perhaps the most help the iPad gives me is when I’m brainstorming an idea in the initial stages. This can be for a piece of writing, or a planned piece of research, or anything really. I will always have a mind map (in iThoughtsHD) for my overall to-do list plans, and whenever I start a new project I make a new mind map for it. I’m not a natural mind mapper, but find it a great way, especially on the iPad in this app, of breaking a task down into smaller stages, recording ideas before I forget them, and moving research on a lot. Using this technique I’ve been able to bring more projects to fruition more quickly than in the past. I also think it’s helped me to be far more creative than I would have been without it. The other way the iPad is brilliant for my way of working is as a concentrated writing tool. Because you can generally only focus on one task at a time in it, apart from possibly playing music in the background or through headphones, it’s very good for focused working. There are a number of distraction-free writing apps out there. I like WriteRoom, and will often take the core structure of a mind map from iThoughtsHD, import it into WriteRoom, and then start to write up my text. This is good for blog posts, short articles, and even academic papers. I also used it for some of my essays and my final project report in the honours level Open University art history course I took for fun last year. WriteRoom provides a word count facility, but little more. No fancy formatting options or anything like that. It’s essentially a getting-the-words-down app, and it’s really good at that. I don’t find the iPad so good for final laying out and formatting. For example in #AcWriMo I’ve been working to get a few journal papers out the door and submitted. And a really important part of that is to make sure that each paper conforms to the journal’s own chosen house style. This editing could be done on an iPad, but I find it easier on my Mac laptop, even a 13″ size one, where I can have two windows open at once. On the left I have the Word window for the paper I’m working on, and on the right I have a window (whether in Word or a PDF, or a web page) containing the journal house style rules. And then I can refer to both as need be. Also I don’t find the iPad as good for higher-level editing, at least in the word processor directly. For Paper 2 in my #AcWriMo goals I’ve been hacking away at the text like mad, making very big changes. And that’s easier done, for me anyway, on a laptop or a desktop. But the iPad is brilliant for annotating text. I have a stylus (cheap but effective, with a squidgy end that presses on the screen as I write with it), and using GoodReader I can open up a PDF that I’m reviewing and considering changes to, then scribble all over it on the screen. Then I can email the annotated PDF to my laptop for making the big changes. Talk about a paperless office! Anyway that method works for me. I also find I get through more PDFs reading them on my iPad than I would on the computer, and I really don’t like printing them all out. Note all this applies to the large-screen iPad. I have an iPad 2. I’m not sure how well I’d work this way on an iPad mini. I think it’s a fantastic device, but the smaller screen size, both for typing on and reading PDFs, might be an issue for me. I have a separate Bluetooth keyboard that I use at times, and would work with an iPad mini too, but I rather like typing on screen as much as I can. So often the iPad is assumed to be a content consumption device, rather than a productivity tool. However since I got my iPad I’ve found it very useful for research and academic purposes. I wish I’d had it when I was doing my PhD, especially writing up the thesis. Unfortunately the iPad only came out after my successful viva! And even then it took me quite a long time to get one, only getting an iPad 2 many months after it was released. The app I find most useful of all productivity-wise is iThoughtsHD. This is a mind mapping app, but can be used by people who don’t generally mind map. 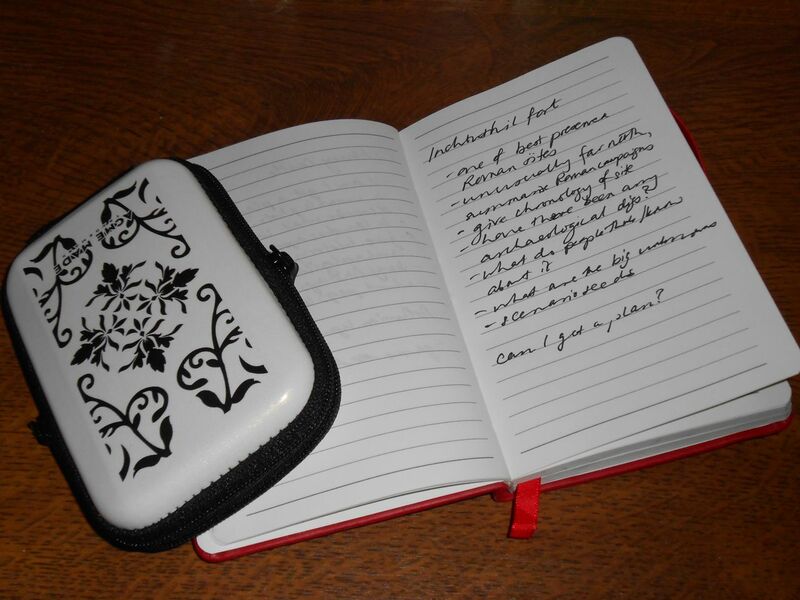 It’s great for brainstorming, and getting ideas down fast. I find that I get things down more quickly and creatively using this app than I did before without it, and that means I get more things done more quickly and better. I have a mind map open for each academic journal article that I’m working on. I also have an overall to-do list / possible research areas one. And I have a few other mind maps on the go just for jotting down ideas. 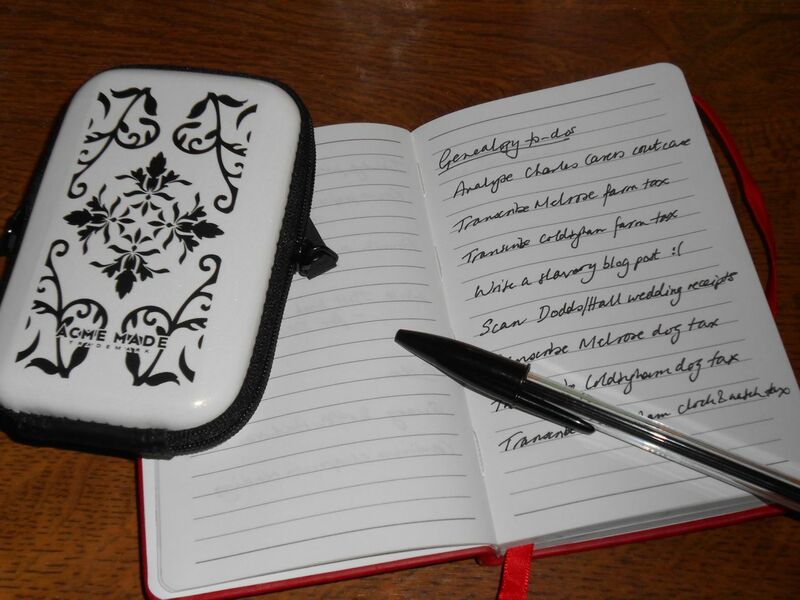 My other favourite productivity app is WriteRoom which is a distraction-free writing tool. There are others like it, but I think it was the first of its kind, and I like it a lot. It lets you focus on writing, getting the text down, rather than worrying about layout and font. I’ll often copy the structure of my mind map / brainstorm from iThoughtsHD into WriteRoom, and then work from there. I find this an easy way of writing up papers and articles. You can customise WriteRoom’s display. I like green text on a black background – very 80s! I think the best PDF app on the iPad is Goodreader. It works well with all different kinds of PDFs, and you can annotate, even with a stylus if you buy one of those. I bought a cheap stylus from Amazon, one with a squidgy foam end that writes pretty well on the screen. And I can then scribble all over the PDF files on my iPad. For example I’m currently turning my PG Masters dissertation into an academic journal paper, and recently made great headway scribbling all over the PDF of the latest version with my stylus. Two other apps that I recommend for following academic/research types are Feedler RSS for following interesting blogs, and Flipboard for turning Twitter feeds and others into a very dynamic and easy to scan magazine-type interface. I follow a lot of historians and archivists on Twitter, and it’s nice to be able to use Flipboard to quickly scan their interesting posts. Also there’s a blog dedicated to using the iPad as an academic/productivity tool. See academiPad.